The fun and learning doesn't stop when school lets out! Various after-school activities and classes are offered throughout the year. From robots to yoga to music to chess, there is a class for you. Students attending after school activities at Rivendell, should first check in to aftercare. Instructors will come to aftercare to check-out students for their activities. For activities beginning right after school at 3:30, you will not be charged an aftercare fee. Please remind your child to go to aftercare first if they have an after school activity. Please note: All communication regarding after school activities (such as schedules, fees, etc.) is directly through the after-school activity provider (via email/phone listed below), not through Rivendell. Offered through Chessmates. Tuesdays 3:30-4:30 p.m. in Room 2 (Suzanne's room), grades K-5th. Cost is $65 for 12 weeks of class and chess instruction. 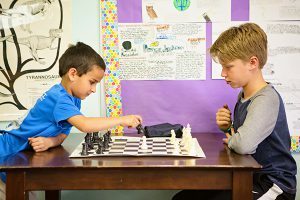 Each class includes 30 minutes of instruction and 30 minutes of playtime taught by an experienced chess coach. Next 12-week session runs Jan. 29 to Apr. 23 (no class March 19). Go to www.chessmatesfc.com to register. Refund policy: Any participant may receive a full refund until after the second class is completed. After the second class there will be no refunds granted or partial credits given for any reason. Mondays or Wednesdays from 3:20-4:10pm (ages 3-12) in the gym, children can participate in Kids Yoga. Kids learn safe stretching, deep breathing, relaxation, focus, and have fun! Space is limited to 10 children per session. To register, please contact Victoria Clarke at rivendellyoga@gmail.com or 970-419-8520. A snack is provided at the beginning of each class; please let Victoria know if your child has any food allergies. This class helps students with letter/sound recognition as well as phonemes and rhyming words. Emerging readers will practice beginning, middle and ending sounds to reinforce decoding skills. Limit of six students, preschoolers age 4 to Younger Kids age 6. Dates and cost tbd, details coming soon. Students will learn rhythm, flexibility, creativity, confidence, balance, dance technique and more. Alison is a teacher at Rivendell who has taught dance classes for 12 years and danced for even longer. Snack will be provided and students can be checked into or out of the aftercare program. Class will meet in the gym. Preschool Ballet/Tumbling: Thursdays 3:15-4:15. Jan 17-March 14. $70 for one student, $100 for two. Younger Kids Ballet/Jazz/Tumbling: Tuesdays 3:30-4:30. Jan 15-March 12. $90 for one student, $160 for two. Contact alison@rivendell-school.org with your interest and include you and your child’s first and last name/age/ preferred time and day.